At least Mercedes doesn’t call it a four-door sports car, but even so, calling it a four-door coupe is almost bad enough. Coupes have two doors. Sedans have four doors. The Mercedes AMG GT 4-Door has, unsurprisingly, four doors. It’s a sedan. But a very good sedan. Fundamentally, the AMG GT 4-Door Coupe has the basic underpinnings of the “normal” AMG GT Coupe. And since the AMG GT Coupe is pretty much a beast, then it’s not much of a stretch to see how the AMG GT 4-Door Coupe should also be as well. 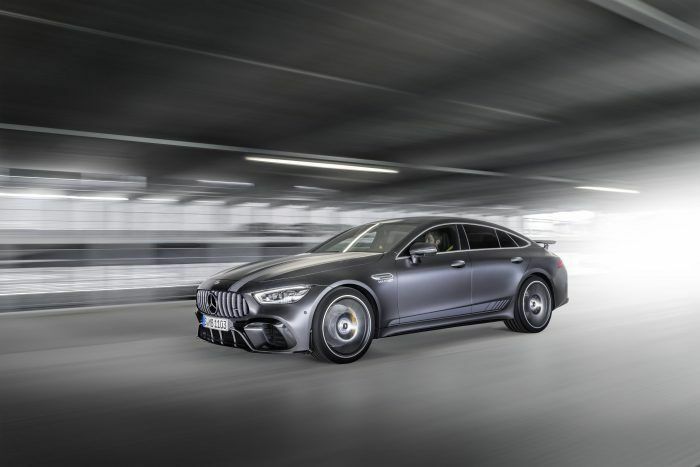 And just to make you feel all special about not just purchasing an AMG GT 4-Door Coupe, but buying one of the first ones to show up, Merc has upped the ante (slightly) with a unique Edition 1 model with a bunch of exclusive interior and exterior bits for 2019. 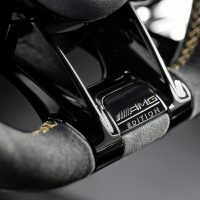 Basically, early adopters get an AMG Aerodynamics Package, special wheels and paint, AMG Performance seats and steering wheel, and Matte Carbon-Fiber trim. 2019 Mercedes-AMG GT 63 S Edition 1. Photo: MBUSA. About that trick areo package. The AMG Aerodynamics Package for the Edition 1 comes with a larger front splitter and integrated aero flics in the front bumper. The diffuser has been “optimized” and the rear spoiler’s angle can be mechanically adjusted. The rear spoiler and larger front splitter, combined with the AIRPANEL active air management system, gets you a noticeable amount of additional downforce, mushing you to the Straße. And as your cherry on top, the AMG Aerodynamics Package also contributes to lower drag, despite the higher downforce. Schlaue Jungs. Other bits and bobs on the outside further distinguish the AMG GT 63 S Edition 1. The paintwork is designo Graphite Grey Magno with matte Graphite Grey stripes on the sides, hood, roof, and decklid. (Hey, go-fast stripes! those should add another 1 mph to your top end, minimum buddy.) There are 21-inch cross-spoke forged wheels, painted matte black with a high-sheen finish, so, you know, you look cool. The interior features such refinements as Multicontour Performance Seats with a Memory Package, Nappa Leather Upholstery in Magma Grey/Black with flashy yellow contrast stitching, a performance steering wheel in DINAMICA microfiber with more yellow stitching, a racy yellow 12 o’clock marking, and an even flashier “Edition 1” badge. There’s lots of Matte Carbon-Fiber trim, the seatbelts are yellow, and the door center panels are Magma Grey. The instrument panel and door beltline get black Nappa leather with that same yellow top stitching. The door sill panels are illuminated and say “AMG.” There are edition-specific floor mats in black with a leather band and “AMG” lettering and, well this is a surprise, yellow top stitching. Last but not least, every man, woman, and child on planet Earth will be overcome with joy when they realize the AIR-BALANCE Package comes with a new, dedicated “AMG #63” fragrance. Take your seats, take your seats!! The Edition 1 comes with the top-of-the-range, handcrafted AMG 4.0-liter V8 bi-turbo engine, cranking out 630 horsepower and 664 lb-ft. of torque. Result? A top speed of 195 mph with a zero to 60 time of 3.1 seconds. So like I said, it’s a sedan, but a very good sedan. 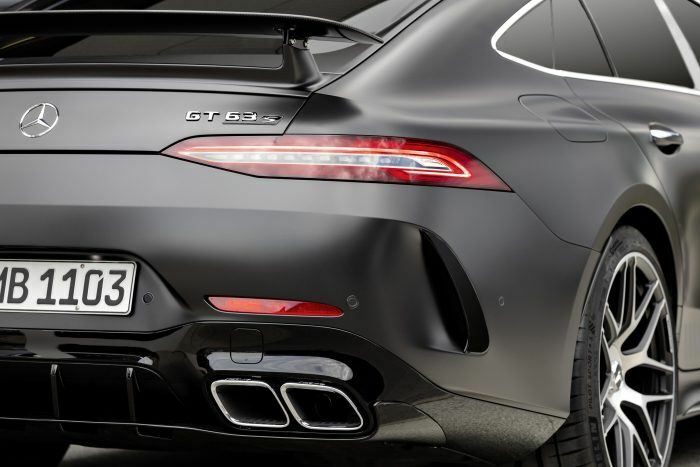 The AMG GT 63 and 63 S will arrive in the United States early next year, with the AMG GT 53 coming in mid-2019.